Perfect Descent Climbing Systems has created an auto belay to meet the different needs of both the climbing gym owner and the climber. The Perfect Descent auto belay is the easiest to install and most cost-effective for owners. Climbers experience the most natural-feel auto belay on the market while being able to train on their own. Eldorado has built more than 1,800 climbing walls for not only climbing gyms, but also recreation centers, YMCAs, schools, playgrounds, and colleges and universities. Eldorado has the expertise and creativity to create a climbing wall that matches your vision, facility, user group, programming and budget. Options include custom and modular products. Choose a company known for creating beautiful and durable climbing walls whose lifespan is measured in decades and not just years. MozaiK XP is the latest EP Climbing Wall surface innovation, stemming from the Lightwave surface, which brings custom flat-panel designs to the outdoor climbing market. MozaiK XP has been in development for two years, ensuring high quality standards. The debut for this surface is in downtown Chicago's nationally recognized Maggie Daley Park with more than 19,000 square feet of climbing surface and routes topping out at 40 feet tall. Safari® Jungle Gym from Everlast Climbing is a line of indoor adventure elements that brings low-threat challenge, fun and fitness to your facility. Similar to some low-ropes course elements, the Safari Jungle Gym elements mount to the wall and engage a wide range of fitness levels. Safari elements can also be used in conjunction with a traverse climbing wall. Elements stow and lock to prevent unauthorized use and can include a Mat-Locking System upgrade. Integrating with PlayBooster® playstructures, the realistic rock panels of The Canyon Collection™ deliver challenging and exciting play experiences on all sides for 5- to 12-year-olds. Molds used to create the Canyon Collection rocks were taken from the Gneiss (pronounced "nice") Outcrops in Southwestern Minnesota to create incredibly realistic textures and rock shapes. Best of all, the Canyon Collection is available in a variety of configurations to satisfy a range of budgets and footprints. Since 1989, Brewer's Ledge has provided customers worldwide with creative climbing and climbing options. Products include LedgeWall™ Panels, Boulderboard® trainers, the Treadwall® rotating walls and the new Laddermill®. 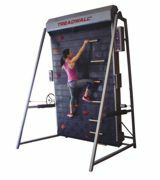 These are innovative products that focus on serious, creative training and climbing, using movement that is functional, fun, whole-body and very effective. Design and production is done in the United States and engineered with the input of customers worldwide. This big tower is a challenging obstacle block in itself. The Wibit Action Tower XXL will test your endurance through climbing, jumping, crawling and sliding activities. It promotes balance, coordination and team-building skills with its combination climber and slide design. Its multi-activity design makes it one of the most versatile waterfront pieces for camps, campgrounds and summer recreation programs. The Action Tower XXL is a great standalone piece or an exciting addition at a sports park.